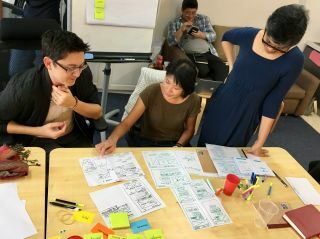 In February, I tried out a new workshop two times—once at Webstock in New Zealand, and once in Hong Kong. This workshop will show you to to think in a progressive way that works with the grain of the web. Together we’ll peel back the layers of the web and build upwards, creating experiences that work for everyone while making the best of cutting-edge browser technologies. From URL design to Progressive Web Apps, this journey will cover each stage of technological advancement. Basically, it’s the workshop version of Resilient Web Design . If that book is the theory, this workshop is the practice. 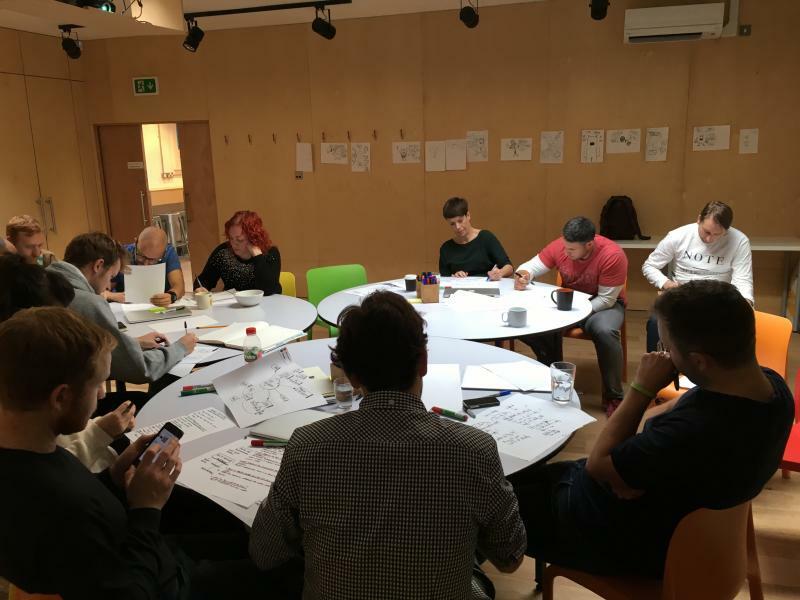 Tim recently posted his tips for running workshops and there’s a lot in there that resonates with me. Like Tim, I’ve become less and less reliant on slides. In fact, this workshop—like my workshop on evaluating technology—has no slides. Instead it’s all about the exercises and going with the flow. First of all, I get everyone to call out websites, services and apps that they use almost every day: Twitter, Facebook, Gmail, Slack, Google Docs, and so on. Those all get documented on the wall. 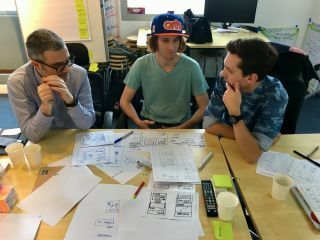 Then it’s time to ask of each product, “What is the core functionality?” The idea here is to get beneath the surface-level verbs like swiping, tapping and dragging to get to the real purpose of a service: buying, selling, sharing, reading, writing, collaborating, and so on. At this point I inform the attendees that the year is 1995. And now we’re going to build these services using the technology of this time. This is a playful way of getting answers to the question “What’s the simplest technology to enable the core functionality?” It’s mostly forms, links, and lots of heavy lifting on the server. Along the way, there are plenty of rabbit holes we can go down. Whether it’s accessibility, or progressive web apps, or pattern libraries, I go along with whatever people are curious about. But all of it ties back to the progressive, layered mindset I’m hoping to foster. “That workshop has completely changed the way I think about building on the web!” (I’m being hyperbolic here, but at the very least I’m hoping to impart a new perspective). Having given the workshop a few times, I’m really pleased with how it went (and more important, I’m pleased that people enjoyed it). If this sounds like something that your company or team would enjoy, get in touch and we can take it from there. Little interventions for designers in the form of questions designed to challenge assumptions. Kind of like Brian Eno’s oblique strategies. 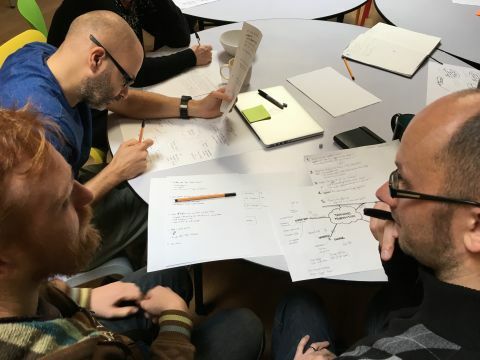 It was only last week that myself and Ellen were brainstorming ideas for a combined workshop. Our enthusiasm got the better of us, and we said “Let’s just do it!” Before we could think better of it, the room was booked, and the calendar invitations were sent. That’s not quite right either. Basically, here’s the issue: at some point everyone at Clearleft needs to communicate something by telling a story. It might be a blog post. It might be a conference talk. It might be a proposal for a potential client. It might be a case study of our work. Whatever form it might take, it involves getting a message across …using words. Words are hard. We wanted to make them a little bit easier. We did two workshops. Ellen’s was yesterday. Mine was today. They were both just about two hours in length. Ellen’s workshop was all about getting thoughts out of your head and onto paper. But before we could even start to do that, we had to confront our first adversary: the inner critic. You know the inner critic. It’s that voice inside you that says “You’ve got nothing new to say”, or “You’re rubbish at writing.” Ellen encouraged each of us to drag this inner critic out into the light—much like Paul Ford did with his AnxietyBox. 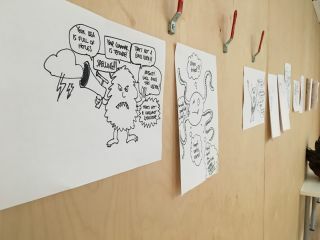 Each of us drew a cartoon of our inner critic, complete with speech bubbles of things our inner critic says to us. 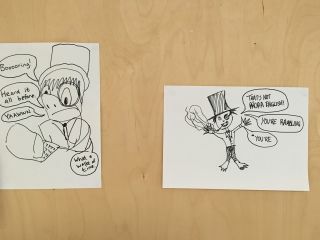 In a bizarre coincidence, Chloe and I had exactly the same inner critic, complete with top hat and monocle. With that foe vanquished, we proceeded with a mind map. 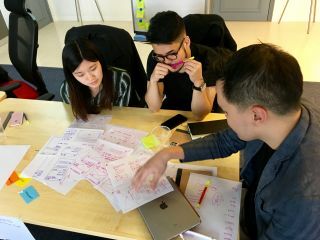 The idea was to just dump everything out of our heads and onto paper, without worrying about what order to arrange things in. I found it to be an immensely valuable exercise. Whenever I’ve tried to do this before, I’d open up a blank text file and start jotting stuff down. But because of the linear nature of a text file, there’s still going to be an order to what gets jotted down; without meaning to, I’ve imposed some kind of priority onto the still-unformed thoughts. Using a mind map allowed me get everything down first, and then form the connections later. What are they sceptical about? What’s different now that you’ve communicated your message? Paint a pretty picture of life for them now that you’ve done that. Finally, what do they need to do next? They’re straightforward questions, but the answers can really help to make sure you’re covering everything you need to. There were many more exercises, and by the end of the two hours, everyone had masses of raw material, albeit in an unstructured form. My workshop was supposed to help them take that content and give it some kind of shape. Ellen and I have been enjoying some great philosophical discussions about exactly what a story is, and how does it differ from a narrative structure, or a plot. I really love Ellen’s working definition: Narrative. In Space. Over Time. This led me to think that there’s a lot that we can borrow from the world of storytelling—films, novels, fairy tales—not necessarily about the stories themselves, but the kind of narrative structures we could use to tell those stories. After all, the story itself is often the same one that’s been told time and time again—The Hero’s Journey, or some variation thereof. So I was interested in separating the plot of a story from the narrative device used to tell the story. Okay. That’s plot. Next we looked at narrative frameworks. Begin at a crucial moment, then back up to explain how you ended up there. Instead of describing the action directly, have characters tell it to one another. e.g. The Dialogues of Plato …or The Breakfast Club (or one of my favourite sci-fi short stories). Begin in the middle of the action. No exposition allowed, but you can drop hints. e.g. Mad Max: Fury Road (or Star Wars, if it didn’t have the opening crawl). Begin with a looooong zooooom into the past before taking up the story today. e.g. 2001: A Space Odyssey . Just the facts with no embellishment. The Three Little Pigs , retold with the wolf already at the door and no explanation as to why there’s straw everywhere (in media res). 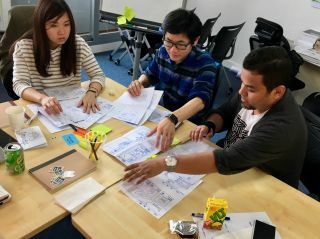 Once everyone had the hang of it, I asked them to revisit their mind maps and other materials from the previous day’s workshop. Next, they arranged the “chunks” of that story into a linear narrative …but without worrying about getting it right—it’s not going to stay linear for long. Then, everyone is once again given a narrative structure. Now try rearranging and restructuring your story to use that framework. If something valuable comes out of that, great! If not, well, it’s still a fun creative exercise. And that was pretty much it. I had no idea what I was doing, but it didn’t matter. It wasn’t really about me. It was about helping others take their existing material and play with it. That said, I’m glad I finally got this process out into the world in some kind of semi-formalised way. I’ve been preparing talks and articles using these narrative exercises for a while, but this workshop was just the motivation I needed to put some structure on the process. 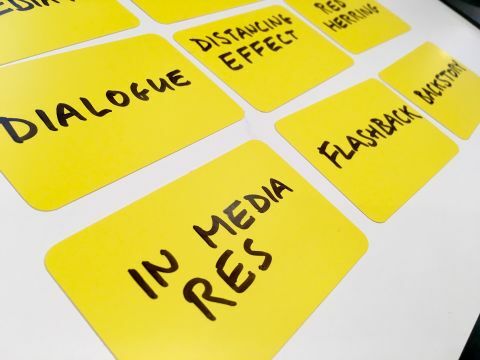 I think I might try to create a proper deck of cards—along the lines of Brian Eno’s Oblique Strategies or Stephen Andersons’s Mental Notes—so that everyone has the option of injecting a random narrative structural idea into the mix whenever they’re stuck. At the very least, it would be a distraction from listening to that pesky inner critic.